The World Health Organization estimates that four billion people (80% of the world's population) use herbal remedies for part of their primary health issues along with, or instead of, over-the-counter medicines and prescribed drugs. Herbal tinctures are one of the strongest uses of the herbs growing in your yard that can be made at home. This is far from a comprehensive list of herbs used for colds and flu tinctures (given in alphabetical order by common name). article to consider for tincturing! * US and UK measuring units are slightly different. Consult a unit conversion chart before accepting dosage by teaspoons. Herbal tinctures can be used for animal ailments, too, but not at the same dosage as for humans. Please consult your veterinarian. Flavored liquors (vodka, rum, brandy, etc.) 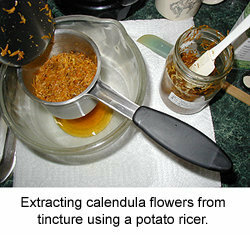 can be used to help mask strong unpleasant tasting herbal tinctures. Everclear is a widely known grain alcohol sold in the United States. It is a neutral, tasteless, liquor with a 95% alcohol (190-proof) content. Everclear has been banned (made illegal) to sell in several states, and its alcohol limits restricted to 75.5% (151-proof) in a few others. Check your state laws for its legal sell and use! Tinctures, also known as herbal, botanical, or ethanol extracts, are herbs macerated (soaked/steeped) in a menstruum (solvent) of alcohol, vinegar, or glycerin, to draw out the soluble plant properties. Alcohol is the most effective solvent at extracting as much of a plant's properties as possible, therefore, alcohol-based tinctures are the strongest of the extracts and have the longest shelf life. If properly stored, and contain at least 25% alcohol, herbal tinctures can sit on the shelf for five years or more. Much of the alcohol can be "burned off" before use by adding the tincture dose to a hot liquid (tea or soup) for five minutes or so. Vinegar and glycerin-based tinctures [Herbal Tinctures video] are not as strong a solvent as alcohol, used primarily as medicinals for children and babies, and require refrigeration for the few months they can be used. Glycerin extracts only the water soluble properties from a plant, so they are most like an herbal tea, relatively weak compared to the alcohol tinctures. Not all herbs are created equally. Some plants have only water soluble constituents making alcohol tincturing unnecessary, and others require less alcohol for better results. The entire plant of some herbs can be used medicinally, but some have both beneficial and toxic parts. Refer to a good herbal guide to learn the specific qualities and the best use of a plant before creating a tincture with it. Please see Additional Herbal References at the end of this article for a list of great herbal books and web sites. Tincturing is not complicated, although, it does stretch out minute steps over time, which warrants the use of a calendar (for me) to not forget about them. Every herbalist and herbal reference book has a preferred method of making a tincture. They may steep their alcohol-infused herbs for a minimum of two weeks in a warm (100° F), dark place, while others soak their herbs for a couple of months in a cool, dark place. Some claim stronger results are produced by preparing tinctures on a New Moon, and extracting them on the following Full Moon. Although combinations of herbs can be used at a time, a single herb tincture is more versatile. 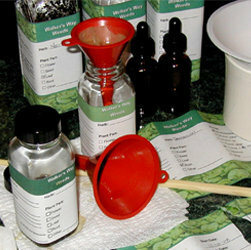 Single herb tinctures can be combined later for custom mixing to suit specific needs. The Traditional Folk method is the least complicated method by using whatever one has available, but the results are inconsistent. The strength of each herbal tincture will vary–one might use more or less herbs or alcohol, or different percentages of alcohol, with each batch–creating problems in determining the proper dosage. The Weight-to-Measure method uses consistent measures, processes, and record-keeping, allowing more uniform potency between tinctures, and doses to be better calculated. The following chart displays universally accepted standards for tincture preparations (established at the International Conference of civilized countries in Brussels, Belgium, in 1902). Following these standards, a person can create tinctures with similar potency and dosing as commercially prepared tinctures. There are exceptions to the rule, so please consult an herbal reference. 2 oz (per liquid measuring cup) of 95% alcohol. 5 oz (per liquid measuring cup) of 40% alcohol. 1. Pack a glass canning jar big enough to hold your chopped fresh herbs; pour in the 95% alcohol. Rubbing alcohol CANNOT be used! It is for external use only and cannot be ingested! Use only food grade alcohol (liquor) when making herbal tinctures. Use the same procedure with ground dried herbs, but use a 40% alcohol. The herbs will partially rehydrate by absorbing the water in the liquor (the reason a liquor with a higher water content is used). 2. Cap the jar and store in a dark, protected area for the next two weeks. 3. Shake the jar daily. Place strained herbs in cheesecloth or muslin, pull up corners of the cloth then twist together and squeeze, or press, the liquid over a fresh container. Place strained herbs into a potato-ricer over a fresh container, apply gradual pressure until all liquid is expressed. Place strained herbs in muslin bags and place under a press with a bowl beneath to catch the liquid. 5. Combine the strained and pressed liquids together in a capped jar and set aside undisturbed for a day or two. Any fine herbal residue will settle to the bottom of the container. 6. 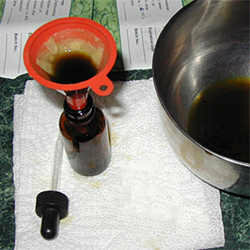 Decant (pour off) the liquid through a fine filter, such as a paper coffee filter, to gain the purest and clearest tincture possible. It may take hours for the liquid to strain through the filter. 7. Store your finished tinctures in dark bottles, labeled with content description and date, in a cool dark place out of direct light. Dropper fitted lids are very handy for dispensing doses when needed. 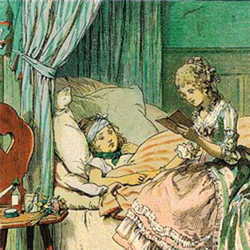 Annie's Remedy: great database of herbal remedies. Challenge: discover your native plants with the same healing properties as those well known across the globe! There is a good bit of personal pride and satisfaction that comes with preparing herbal tinctures from your garden plants. Homemade herbal tinctures can be substantially cheaper than similar commercial products, have a very long shelf life, versatile, and you have confidence in knowing the contents of your herbal extracts. That's a lot of bang for the buck! Traditional Medicines. WHO Centre for Health Development Kobe, Japan. 6 Nov 1999. World Health Organization. 2000. 76-pg. WHO_WKC_SYM.pdf. 5 Jan 2009. Dr. Chong. History of Herbal Medicine. Herb Palace. 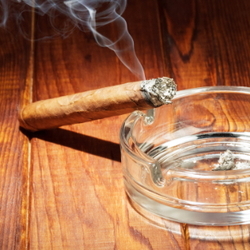 Quit Smoking With Home-Grown Herbs Herbal Remedies for Cold & Flu Symptoms: What's For Dinner? 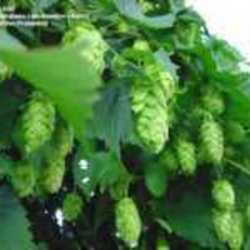 Hops are not just for beer. They make great ornamentals in the Home Garden!